My basic tactical breakdowns for the Japanese-language edition of Goal.com continue this week with another Euro 2012 special, this time looking at France’s failed attempts to keep out the defending champions, Spain. The four quarter-finals at Euro 2012 were far from rich in decisive tactical nuances. Three of them involved a clear favourite defeating a lesser-rated rival whose defensive game plan had failed and who offered very little by way of attacking response (with the possible, slightly fortunate exception of Greece). The fourth, predictably, saw England sit deeper and deeper as they successfully frustrated Italy for 120 minutes with their energy-sapping brand of anti-possession football; presumably having forgotten that ‘penalty shootout’ is actually old Anglo-Saxon slang for ‘inevitable English defeat’. Had the two Ashleys, Young and Cole, held their nerve, I would probably have been tempted to indulge in a piece about how Roy Hodgson had quickly instilled a sense of organisation into my homeland’s football team. Instead, however, an emotional rant by my colleague at The Blizzard, Philippe Auclair, persuaded me to take another look at his French compatriots’ seemingly straightforward 2-0 defeat to world and European champions Spain; a game that failed to spark much excitement around my table at the bar as the sun rose over Osaka on Sunday morning. The gamble that he ultimately came up with was, essentially, to field two right-backs, with Anthony Réveillère coming into the back four and Mathieu Debuchy stationed slightly ahead to play a marking job on Jordi Alba. The rationale was that Spain’s occasional travails in the group stage, not least in the first half against Italy, had generally arisen when their play became narrow and thus congested in the middle of the park. With Sergio Ramos forced into central defence, Alba represented their one genuine source of width and was therefore targeted for nullification. On the opposite flank, by contrast, Franck Ribéry was pitted against the more conservative Álvaro Arbeloa. It wasn’t quite a back five per se; more a defensive and extremely lop-sided 4-5-1. Vicente del Bosque, meanwhile opted to restore Cesc Fàbregas to the ‘false nine’ role that hadn’t really worked against Italy, but the subtle positionings and movement were slightly more effective. Andrés Iniesta and David Silva were able to drag the French full-backs out of place by moving inside rather than staying there; similarly Fàbregas on Adil Rami in the centre. As in the second half of that opening group game, Xavi stepped forwards to provide an extra vertical layer into which the excellent Xabi Alonso – afforded space by France’s preoccupation with Alba’s flank – could pass. France still had Laurent Koscielny as defensive cover and, true to plan, restricted opportunities for Spain to either shoot or work the ball out left. 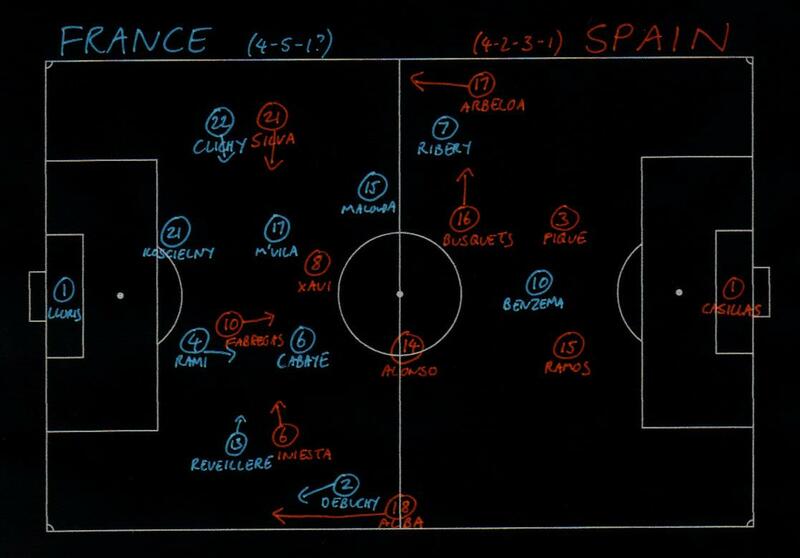 However, the one time that the double right-back strategy slipped up – literally – Spain scored. Collecting the ball on the overlap from Iniesta, Alba was afforded an extra touch and time to size up his cross when Debuchy lost his footing; Alonso was the grateful recipient with a fine header at the far post. Thereafter, it mattered little that the Spanish offered limited penetration or entertainment; they had their lead, and France’s battle scheme thus counted for little given that it evidently did not actually extend to scoring goals themselves. Sergio Busquets provided an effective, additional shielding job on Ribéry, leaving Karim Benzema utterly isolated up front while Florent Malouda was simply not cut out for the role of linking defence and attack. Blanc was understandably frustrated that his Plan A was undone by a mistake it simply could not afford. Tellingly, however, the lack of a considered Plan B meant France registered not one shot on target after half-time. 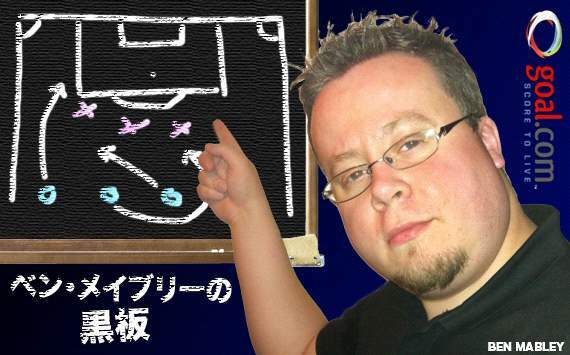 My quest to introduce a bit of basic tactical theory to a Japanese readership at Goal.com continues this week with a Euro 2012 special. Click the image below to see the main Goal.com Japan article, or scroll down for an English-language version. Group C at the European Championships has provided those of us who like to observe such things with a curious refresher into tactical theory – largely because of the somewhat retro 3-5-2 system deployed by Cesare Prandelli’s Italy. 3-5-2 enjoyed a short-lived boom in the mid-to-late 1990s (it continued slightly later in the developing J. League) – perhaps best exemplified by the European champions of Germany in 1996 and Borussia Dortmund in 1997, each with Matthias Sammer at sweeper – because of two inherent benefits it offers when pitted against the 4-4-2 formation that was prevalent at the time. Firstly, the third central defender provides an extra man to cover his colleagues and frustrate the opposing forwards. And secondly, the numerical superiority in midfield helps the side playing 3-5-2 both to control possession in the middle and to work the ball wider, thereby winning the battle on the flanks too. However, each of these benefits are negated, and even subverted, by the now-fashionable 4-2-3-1. A third centre-back is rendered superfluous; an unnecessary second spare man at the back. The default midfield becomes five on five, rather than five on four. And, crucially, the opposing full-backs now enjoy the freedom and space to break forwards – one at a time – providing as they do both an effective sixth man in an even wider midfield and, therefore, control over their respective wing. The main reason that teams like Juventus and Udinese have been able to enjoy renewed success with their takes on 3-5-2 over the last two years has been the peculiar tendency of Serie A sides to eschew width in favour of a very narrow 4-3-1-2; or, this past season, to adopt a reactive back three themselves. It was, therefore, particularly odd that Spain should choose to face the Italians with no genuine forwards, but a narrow midfield and a false nine (essentially, a player who nominally adopts the central striker’s position but actually tends to drop deep into midfield). The choice of Cesc Fàbregas – a virtual ‘false ten’ – for the latter role was surely contributory to the world champions’ lack of vertical penetration as he, David Silva, and Andrés Iniesta all looked for gaps in front of the Italy defenders. Here, and in central midfield, it became a straightforward three on three. 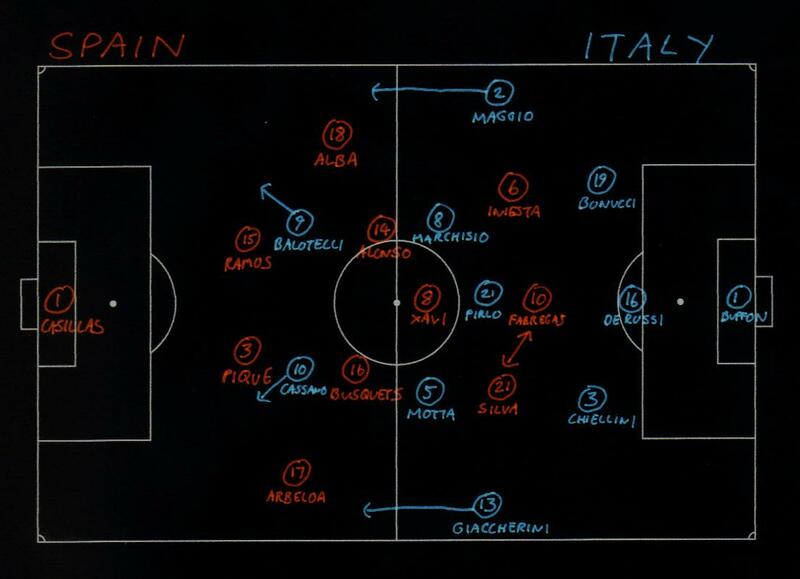 Though Spain characteristically enjoyed more of the ball and pressed the back three without it – albeit insufficiently in the first half – Italy could develop their possession more effectively by utilising the flanks. Here, Christian Maggio and debutant Emanuele Giaccherini had much more scope for creativity than Jordi Alba and Álvaro Arbeloa, who had to help out a defence already being dragged wide by Mario Balotelli and Antonio Cassano. The pattern was gradually altered in the second period as Xavi came further forwards and Spain worked the ball better across the width of midfield, allowing Alba to join the attacks. As Italy tired and Fernando Torres arrived in place of Fàbregas, it was Vicente del Bosque’s side who ended the likelier to score again. 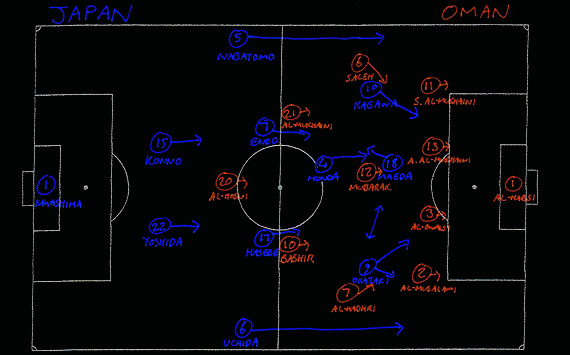 Croatia, too, began their game against the Azzuri in Poznan as if they had forgotten how to play against a 3-5-2. Although Luka Modrić dropped much deeper than he had in their 3-1 win over the Republic of Ireland, Mario Mandžukić generally stayed a little too high up alongside Nikica Jelavić, resulting in what was effectively a misshapen 4-4-2. Even more fatally, the free man left in the centre was Andrea Pirlo. Italy went in 1-0 ahead, having registered 11 shots to Croatia’s three. However, Slaven Bilić was able to decisively shift the momentum his side’s way with a radical shift in shape – not personnel – for the second half. Croatia became a 4-2-3-1, with Modrić now close against Pirlo in the middle of the three, Ivan Rakitić pulled back into a volante position, and Mandžukić now on the right. Classically, Italy thus lost their control of midfield, were pushed backwards as a result, and their wing-backs were left exposed by the new-found ability of full-backs Darijo Srna and Ivan Strinić to burst forwards. Mandžukić converted a cross from the latter to seal a deserved draw for the Croats, who outshot Italy 7-3 after the restart. Again, Prandelli had been unable to respond effectively to his opposite number’s modifications. Italy are now vulnerable both to the approach of their former manager Giovanni Trapattoni, who may well adopt a more defensively-minded 4-5-1/4-4-1-1 for the already-eliminated Irish, and to the prospect of a Euro 2004-style 2-2 draw between Spain and Croatia – which ought to be the most tactically open and hopefully entertaining match of the group. Not even the increasingly bizarre performance of a referee clearly keen to dominate the proceedings himself could spoil a wonderfully intense encounter between two of Asia’s big three. Having observed the lack of coherency shown by the Socceroos in admittedly scorching heat away to Oman last Friday, Alberto Zaccheroni would surely have fancied his side’s chances of finding space in between two Australian banks of four – whose flatness was engrained when the ever-creative Marco Bresciano was replaced by Mark Milligan due to injury after just 12 minutes. However, the hosts began with such intensity and directness that, for half an hour, Japan struggled to cope. Holger Osieck’s men accounted for their numerical inferiority in midfield by bypassing it completely, sending long balls out of defence towards Tim Cahill and Alex Brosque. The strength and canniness of the front two generally ensured that they would win the headers and hold the ball up for the cavalry charge of Luke Wilkshire, Matt McKay, and the other players passed over in the previous phase. But part of the reason they were able to do so was the way in which Japan retreated, and even occasionally fell into the trap of doubling up on headers – thus leaving a yellow shirt unmarked. 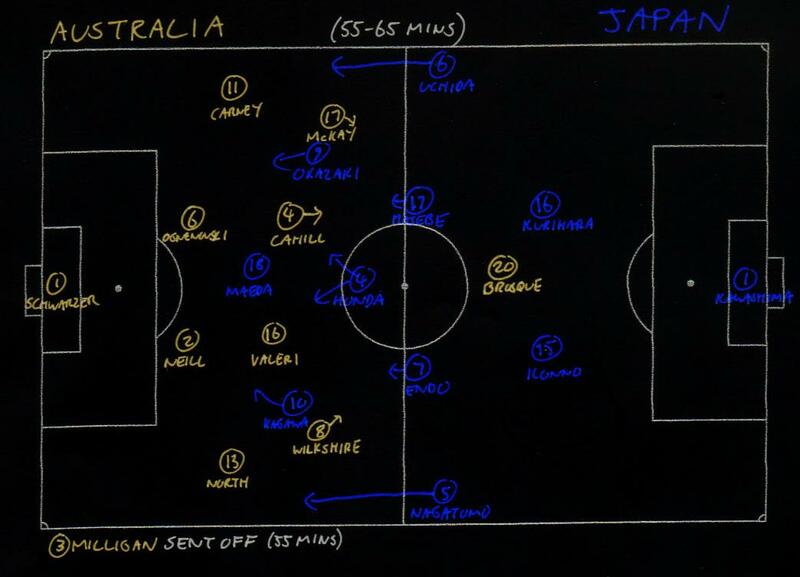 Instead of pulling Australia out of position, Japan were being pushed out of theirs. The visitors’ counterattacks began from so deep that they lacked support and soon ended with nine Australians behind the ball again. Japan needed to be braver in order to reverse the trend. From around the 30-minute mark, the volante pairing of Yasuhito Endo and Makoto Hasebe began playing noticeably higher up the pitch, with the back four also advancing and closing down the Australian forwards with greater confidence and urgency. Pressing as a team, Zaccheroni’s side made it harder for the Socceroos to maintain possession within their direct style, and could now start playing the ball across midfield a little more themselves. 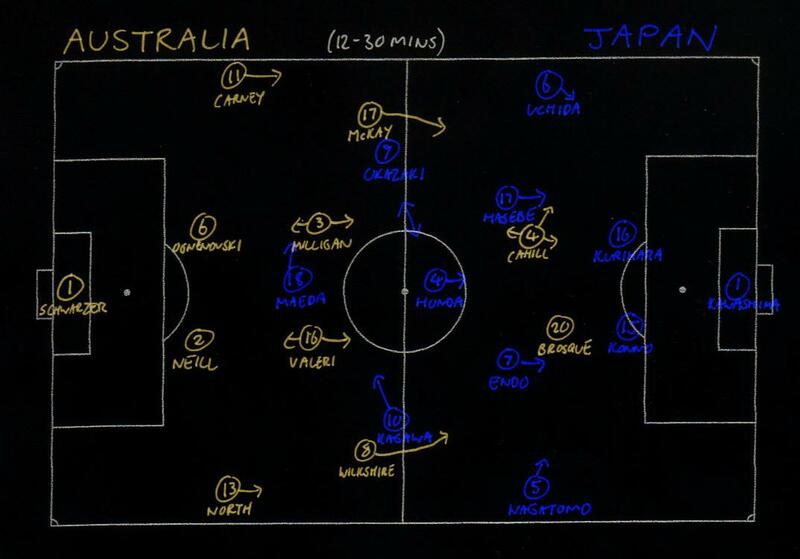 They still didn’t enjoy masses of space, but the new-found ability of the midfield to function as a five gave Australia problems and allowed the full-backs, Yuto Nagatomo and the especially industrious Atsuto Uchida, to overlap and even penetrate the 18-yard box. By the early part of the second half, it was Japan who were imposing their game on the opposition. When the physical Milligan saw red – perhaps harshly – for a second bookable offence, Cahill moved back to slot into his vacated position in central midfield. This did not really affect the way that Australia defended the Japanese passing moves, but with Brosque now the lone focal point upfield, it meant that their long balls from the back were more easily quelled. In turn, Japan could enjoy sustained possession and pressure. The opening goal for Yuzo Kurihara was created via a clever, jinking run along the by-line from Keisuke Honda following a short corner routine with Hasebe – a moment of inspiration which seemed to embody Japan’s enjoyment at rediscovering their supremacy. To their credit, ten-man Australia responded with an immediate burst of intensity, taking risks to pile men forwards and win a corner from which Uchida was confusingly penalised for supposedly impeding an unprotesting Brosque. Wilkshire netted the resulting spot-kick, and this seemed to rattle Japan for a while. Now advancing the ball along the ground more via Cahill, the hosts kept up the pressure at 1-1 and could have led when Sasa Ognenovski’s shot hit the crossbar. The Samurai Blue did settle eventually, but lacked the decisiveness to produce a winner before Kurihara was dismissed – for some reason – in the final minute of the 90. It may feel like two points dropped, but this was still a very useful draw in undoubtedly Japan’s toughest fixture of the qualifying process. Oh, for more days like this. 24 hours ago, at about 5pm on Tuesday, the sum total of my ideas for today’s article was a revised (and partially rehashed) musing over the increasing capabilities of the Japan national team to take their game to all opposition great and small within a 4-2-3-1 system. Keen to break up the regular tactical analyses, however – not least because of the merciless ribbing they receive on Twitter from my less chalkboard-inclined colleague and last week’s Football Japan Minutecast guest, Sean Carroll of the Daily Yomiuri – I racked my brains for an alternative angle. Then came the breaking news that confirmed the transfer of Japan’s number 10, Shinji Kagawa, from Borussia Dortmund to Manchester United for a fee that could rise to £17 million. Admittedly, the impending switch had been little secret, but that doesn’t make it any less monumental. Discussing the former Cerezo Osaka man’s prospects during the aforementioned Minutecast, Cesare Polenghi of Goal.com opined that “the moment that Shinji Kagawa signs the contract with Man. United is going to be the greatest moment in the history of Japanese football”. Placed within their respective eras and contexts, this claim might well be disputed by those behind the successes of Mexico City 1968, the inauguration of the J. League, and the World Cups of 1998, 2002, and 2010. But Kagawa’s move undoubtedly represents a new high-water mark; if not quite Usain Bolt scorching through 100m in 9.58 seconds, then at least an incremental progression of the record. From a United perspective, one of the most exciting things about the arrival of their first ever Japanese player is the variety of options that he will offer. For his country, Kagawa typically plays on the left of the attacking midfield three in that 4-2-3-1 (sorry, Sean), but word stemming from his discussions with Sir Alex Ferguson before joining up with the national squad last month is that his new club manager envisages using him in a central role akin to that in which he has excelled at Dortmund. This seems to imply that Wayne Rooney will return to the more advanced position from where he scored 34 goals in 2009/10, with Kagawa in the supporting role within a 4-4-1-1 for most Premier League matches or a 4-2-3-1 for European and important domestic fixtures. But Ferguson likes to rotate his side, and even if Rooney is withdrawn behind Javier Hernández or Danny Welbeck, the Kobe native could still reprise his Japan role or even find opportunities further wide on the flank. The prospect, albeit only speculative, of United reworking their dynamic 4-3-3-0 system of 2007/08 – with Kagawa and either Ashley Young or Nani taking the places of Carlos Tévez and Cristiano Ronaldo – is also pretty mouth-watering. And then, of course, there is the matter of Kagawa’s playing talents. Europe, and particularly the United Kingdom, can remain stubbornly ignorant about affairs outside its own borders, and the dismissive attitude of those in Germany who questioned the feasibility of Dortmund being revitalised by a 21-year-old whose career had largely been played out in the Japanese second division is now being replicated, in part, by English observers who seldom deign to observe the underrated Bundesliga. United’s commercial director, Richard Arnold, was moved last week to insist that “we don’t sign players to sell shirts”, but in some quarters, the Kagawa transfer is being cited as another typical example of the club’s enforced austerity under the cynically debt-ridden Glazer regime. A low-profile, second prize; following the Red Devils’ failure to seize the real jewel of the summer transfer market, Eden Hazard. The comparisons, and the comparative attitudes shown to both deals, are frankly ludicrous. Hazard, signed by oil-rich Chelsea from Lille in a blaze of publicity for a whopping £32 million, is undoubtedly an excellent player by French league standards, but the assumption – for this is what it is – that his should be a card to overwhelmingly trump Kagawa’s is simply not borne out by evidence on the pitch. Upon arriving from Cerezo, Kagawa took to the Bundesliga – a higher quality competition than Ligue 1 – like a duck to water, instantly wowing the iconic Südtribüne at the Westfalenstadion with a raft of goals and assists en route to Dortmund’s first title in nine years; and a place in Kicker’s team of the season despite missing half of it with a broken metatarsal picked up at the Asian Cup. Upon returning from injury, Kagawa regained his mojo to inspire his club throughout the second half of last season, winding up with 17 goals in all competitions for the Double winners and 13 assists to become, as Rafael Honigstein indicates, “the league’s most efficient and best attacking midfielder, ahead of Bayern [Munich]’s Arjen Robben and Franck Ribéry”. The crowning moment was, of course, the 5-2 victory over Bayern in the DFB-Pokal final where, watched in person by Ferguson less than 24 hours before the climax to the Premier League season, Dortmund’s golden boy scored the opener and was involved in all four that followed. A diminutive, 5’ 7” stature has predictably been the source of stereotyping. Ferguson, and those who have actually watched Kagawa, have been impressed with a player who has not only dealt calmly with the physicality of German defences, but also developed real maturity over the past two years and continues to demonstrate a relentless work ethic when it comes to defending and pressing from the front. It is clear that he is now ready to make the next step. Hazard is a somewhat rawer talent, only now beginning to complement his undoubted technical skills with goals – 20 in Ligue 1 last season after a combined 16 in the previous three, and two in the last 12 months for Belgium (against Kazakhstan and Montenegro) after failing to hit the net in his first 22 caps. The only obvious superiority to differentiate him from Kagawa is his ability to talk the talk; having effectively used agents, mixed zones, and Twitter to massively inflate the hype and financial offerings surrounding his future potential. A number of would-be suitors were teased before the 21-year-old finally plumped for a reported 170 grand per week at Stamford Bridge. Two years the Belgian’s senior, Kagawa will be earning considerably less at Old Trafford, but has remained true to his sensible nature in subtly positioning himself in the ripest possible position for career and personal progression with 12 months left on his Dortmund contract. The multitude of variables involved dictates that no transfer can ever be a cast-iron guarantee of success. But United have every reason to be quietly confident that their man is a surer bet than the flirtatious former Lillois pictured outside the Koning Boudewijnstadion with a hamburger minutes after being substituted during the Rode Duivels’ 1-1 draw with Turkey in Euro 2012 qualification last year. Footnote: What next for Honda? Next on the Japanese football wish list is a similarly big move for Keisuke Honda, still Kagawa’s senior at international level in the sense that it is he who enjoys the coveted central berth within the attacking midfield three. How he must wish he had received the same career advice as his kōhai, having signed a long-term deal with CSKA Moscow just six months before his stock rose dramatically at the 2010 World Cup and realising that the hardly impoverished Russians did not need to sell. After a last-minute hitch cost him a move to Lazio this January, one can but hope that he is not forced to stagnate any longer. This week’s tactics piece for Goal.com Japan looks at the national team’s comfortable 3-0 win over Oman on Sunday, including the role of new Manchester United signing Shinji Kagawa therein. Click below for the Japanese version, or scroll down for the English. When a side wins by three clear goals at home to clearly inferior opponents, there is usually limited value in analysing the tactical nuances of the game in question unless placed into a wider or alternative context. Japan got their final World Cup qualifying group campaign under way in perfect fashion with a 3-0 victory over Oman – a level of opposition against which they have frequently been frustrated in the past – and made a success of deploying their now-trademark 4-2-3-1 formation which, in previous guises, could lack penetration when the onus was on them to attack. Oman did not arrive to play all out defence per se, and while their back line of four was flat and rather narrow, it did originally attempt to play relatively high up the pitch. However, the Samurai Blue demonstrated their attacking intentions within the opening minute and their ability to see them through inside the first ten. Almost straight from kickoff, Shinji Okazaki burst down the right-hand flank and won Japan’s first corner. Moments later, the VfB Stuttgart man quickly angled his run inside to leave space for Atsuto Uchida to charge into. As he did so, the hosts could effectively leave four men waiting in the middle, with Shinji Kagawa moving in from the far side and Keisuke Honda stepping up from his comparatively deep starting position. Under Takeshi Okada, Japan would often lack movement and fluidity within a 4-2-3-1, which could leave several players somewhat isolated. On Sunday, however, their coherency bred confidence and options; stemming from a willingness to defend from the front. Kagawa and, in particular, Honda, were frequently seen rushing in to reclaim the ball from the Omani players (who were, admittedly, often poor in possession). The new number four’s tendency to come slightly deeper than Kagawa and Okazaki allowed him to link effectively with the intelligent volante pairing of Yasuhito Endo and Makoto Hasebe, with attacks then launched with passes to the overlapping full-backs (usually Uchida) or over the top to the ‘wide’ forwards breaking inside. This, combined with the pressing, pushed Oman backwards and essentially allowed Japan to ‘layer’ their attacks when possession was regained after a breakdown. It was under such circumstances that the opening goal arrived. Ryoichi Maeda, who worked hard to drop off and involve himself in the build-up play, played in Yuto Nagatomo to cross for the unmarked, late-arriving Honda to fire home superbly. Sergio Echigo remarked in television commentary that Japan played the second quarter of the game as if they were at least 2-0 up, which was true; the intensity of their attacks soon dropped off as their dominance on the ball was rarely threatened. The tempo rose again after the managers’ half-time team talks, however, with Oman initially looking to pass the ball more quickly but again being careless in doing so. The hosts went more actively in search of goal, mixing up their earlier passing play with more concentrated possession for the danger men nearer the left flank – Endo, Nagatomo, Honda (to a certain extent), and Kagawa. Twice in three minutes, too many visiting defenders were caught watching the latter as he moved languidly with the ball before quickly unleashing a pass to Maeda. The Jubilo Iwata man pounced for Japan’s second; Okazaki got to his rebound for the third. The remainder of the match became a formality. Japan will hope for more of the same against Jordan on Friday before heading to Brisbane for the big clash with Australia – the kind of challenge in which, under Alberto Zaccheroni, they have tended to thrive.